The promotional witz case with sunscreen, jelly, & lip balm contains a natural flavored lip balm. Includes 1 oz. SPF 50, 1 oz. Aloe Ice Jelly and SPF 15 Lip Balm. An amazing combination of usability and safety, the Witz case with sunscreen, jelly, & lip balm is a nice way to show your concern for your valuable customers. Make this unique sun protection kit your next giveaway and see how it brings the recipients closer to your brand! 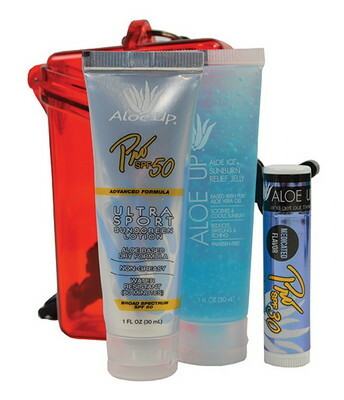 This kit includes a durable and strong, water resistant, crush resistant ABS plastic case that stores skin care products as well as other belongings for travel and outing. This case comes with an O-ring to keep the contents free of dust and water. It also includes a carabineer and lanyard for ease of use. The kit consists of high quality and effective sunscreen lotion, ice jelly and lip balm to offer optimum weather protection outside. Include your brand logo and advertising message on the product and your recipients will definitely appreciate you for years to come.